I think Agathodaimon realizes what a third release means to a band and its future career. And from what I hear on “Chapter III”, they didn’t waste any time and delivered the best German black album to date. Perhaps I shouldn’t only use the “black” tag as a description here because “black-gothic” would fit them more accurately, but “black” is definitely the main component here and is greatly visible on most of the tracks. What’s most remarkable on “Chapter III” is the fact that from all 9 tracks, there is not a single one that reminds you of any previous ones nor will it be repeated somewhere at the end. What I want to say is that Agathodaimon did something that is quite rare in today’s scene and that is that they recorded an album full of first-class tracks that will not bore you with repetitiveness but rather surprise you with lack of any stylistic boundaries and the freedom with which all the musicians progress between them. From the Dissection-like opener ‘An Angel’s Funeral’, melodic but without a hit-sound ‘The Ending of our Yesterday’ or dynamic ‘Burden of Time’ Agathodaimon moves to slower but groovy ‘Past Shadows’, and then lay on classic guitars with an almost Anathema-like melancholic solo in ‘Yesterday’s Reprise’. I know that a lack of stylistic or musical boundaries in combination with a perfect production can scare the hell out of some “true” black metal fans, but that’s why their favorite bands eat their own tail and Agathodaimon moves forward. So, if you are up for some great music "Chapter III" will take one of your top spots of this year. Bottom Line: At the beginning I said the best German black album to date... well, that’s not entirely true. 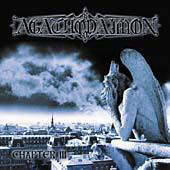 With “Chapter III” Agathodaimon just knocked down few bands from my top 10 in the world.